Hank Jones, piano; Kenny Burrell, guitar; Joe Benjamin, bass; Charlie Persip, drums. The title Midnight Oil applies to two aspects of this album; its preparation and its results. 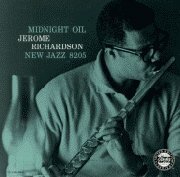 The latter is that, in the main, the end product of the actual session is jazz music of a late-hour, mood variety; the connection with the former is the signification of Jerome Richardson's burning of the proverbial witching-hour fuel in completing the written portion of the date. The session begins with "Minorally" which, as its title indicates, is in a minor groove. The comfortably swinging tempo is a cushion for Jerome (on tenor), Kenny Burrell and Jimmy Cleveland. After Richardson and Charlie Persip exchange thoughts, the theme is re-stated. Hank Jones has a bit in the bridge on this last one. "Way In Blues" [mp3] has a pastoral beginning and a Panish, Puckish blues theme. solos are by Jones, Burrell, Richardson (flute) and Cleveland. Jerome has written an attractive line in "Delerious Trimmings" and voiced it in an interesting manner. He plays alto flute here; Kenny, Jimmy and Hank follow. Side two is devoted to the music of other composers. Juan Tizol's "Caravan" finds the others backing Jerome's fluted theme statement with varied rhythmic motifs. Interludes are also imployed. Cleveland uses 4/4 to swing against on the bridge but it is not until the regular chain of solos begin that it returns. Persip has a thoughtful solo on this one. Artie Shaw's "Lyric" is a happy tune, one that makes you hum it to yourself in unguarded moments. Hank had played it with Shaw's Gramercy Five and taught it to Jerome at Minton's. Jerome is on flute again. "Cleve" drops out and Hank, understandably, takes a gorgeous solo. Bringing these musicians together to play these tunes did not produce the "greatest album of the year" but what it did accomplish is a thoughtful set that becomes more listenable as you play it. That is something to be said for any album in this day and age.